The emergence of fresh asparagus in the market means that February, the most produce vacant month, is over. Spring will soon present us with fava beans and strawberries but asparagus appears first. Enjoy it in March and April when it is pencil thin and sweet. 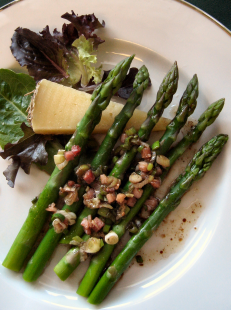 By June asparagus is woody and vegetal, lacking the balance of early spring sweetness. After a few weeks of steamed asparagus spears barely kissed with butter and salt I am ready for a more complex treatment. Something brimming with the balance of all five taste sensations: salty, sweet, sour, bitter and umami. You know umami….the mouth feel of savoriness common to meats, cheeses and other proteins. This recipe calls for robust ingredients used with a light touch, as flavor accents. Pancetta provides saltiness. The sweet comes from balsamic vinegar, as does the sour. Green onions and rosemary are the bitter balance in our taste equation. And the umami? The cheese. The sum of these flavors is complex and yet the asparagus retains the feeling of spring time freshness. your photos are true Art. I cant take my eyes off of them. such talent ! !